To schedule your home energy audit and blower door test, call us at 1-855-410-0662 or click the button below. We are the area's trusted home energy contractor serving Charleston, Myrtle Beach, Sumter and surrounding South Carolina & North Carolina areas. A blower door test can help determine areas of your home that need air sealing and more insulation. As a qualified home energy contractor, we can recommend and provide the best solutions for treating your home's comfort and energy problems. 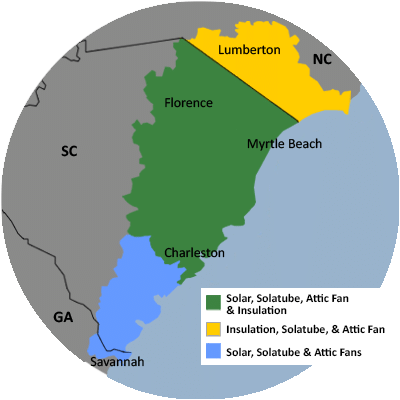 We provide insulation upgrades and other home energy improvements in Eastern SC, including Bluffton, Florence, Mount Pleasant, North Charleston, Darlington, Beaufort, Goose Creek.